Is this adviser useful after all? In this column, we aim to answer precisely this. For starters, however, we will, as usual, say a few words about how this advisor operates: to issue a buy/sell signal, a single moving average (MA) is used, intersected by the price. MaximumRisk – this setting is responsible for money-management. If you set it to 0.01, the advisor will risk 1% of your deposit in every transaction. If its value is set to 100, then the size of the transaction will equal that of your deposit. Such an option is not acceptable according to the rules of capital preservation. Textbooks recommend that a single transaction should not exceed 2-3% of your deposit in size. Having said that, these things are quite personal and should be determined by the trader’s character and trading strategy. DecreaseFactor – this setting is responsible for limiting losses. For example, if it is set to 2, the size of the lot will be halved after any loss-making transaction. 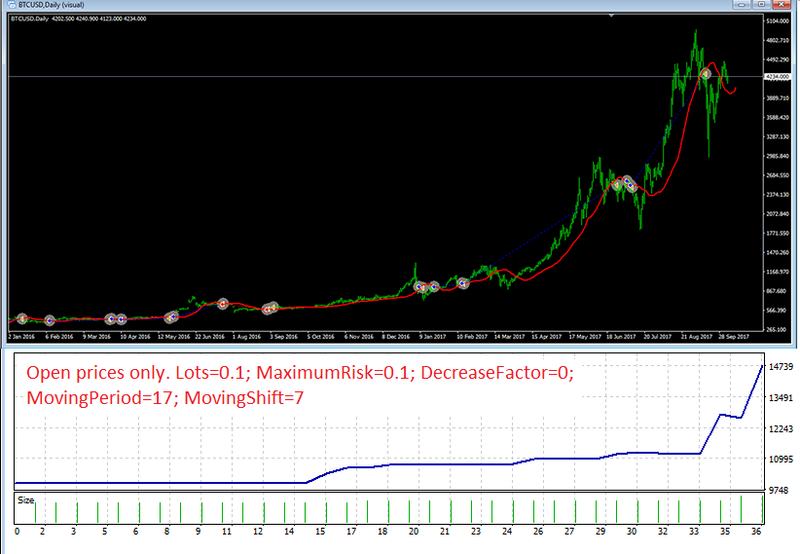 MovingPeriod – this sets the period of the moving average (MA). MovingShift – this determines the movement of the MA. As was said earlier, we used 0.1 as our starting lot. The testing period was the one and a half-year period from 01 January 2016 to 30 June 2017. We started off with a grand-scale test based on the ticker history of EUR/USD. We will admit straight away that this analysis took us more than two whole days, with the best result being observed on the H4 interval. Using the settings shown in Fig.2, the profit was USD 16131 with a maximum drawdown of USD 6180 and a very conservative number of transactions: just 46, i.e. less than 2 transactions a week. The maximum risk taken was 11% of the deposit. For traders who lack a large deposit there exists a higher ‘value’ option (Fig.3). In this case, there was a profit of USD 1202 on H4 with a maximum drawdown of USD 592. Total transactions amounted to 105, whilst the maximum risk undertaken was just 1%. The best profitability/risk ratio for USD/JPY was achieved on the H1 time-frame. Using the settings displayed on Fig.4, the profit was USD 9354 and the drawdown - USD 4236, with a total of 371 transactions and maximum risk that never exceeded 5%. We also found a ‘value’ option for USD/JPY (Fig.5): on Н1 and with a drawdown of USD 593, the profit amounted to USD 1216, the number of transactions to 231 and the maximum risk to 1%. Any trader would recognise that neither this or any other of the aforementioned results give reason for optimism. It is difficult to argue with this. Testing on GBP/USD also failed to deliver anything even mildly impressive (Fig.6). The best result for that pair was on the H1 time-frame: a profit of USD 4285 and a drawdown of USD 3350, over 275 transactions and a maximum risk of 4%. As was the case with MACD Sample, the results above demonstrate that the Moving Average adviser can provide a certain amount of profit under certain settings; we cannot, though, speak of any sort of stable income. In the case of multi-currency trading and under very stringently selected settings these results can, however, be improved. 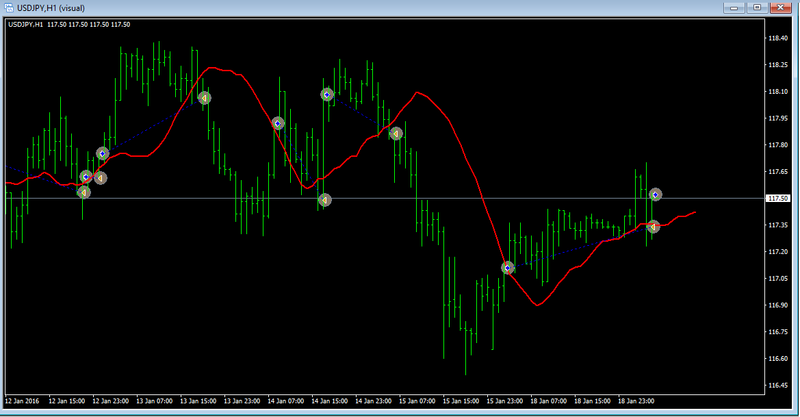 Having said that, our analysis demonstrates that the advisor can only trade profitably on the H1 and H4 time-frames. On the smaller time-frames of M1, M5 and M15 there were no positive results whatsoever for any of the pairs we tested: EUR/USD, USD/JPY and GBP/USD. This suggests that the adviser is unsuitable for scalping and intraday trading. We now turn to the most interesting and unexpected result, which we have left for the very end. Even though the advisor’s creators never even thought of trading cryptocurrencies, the advisor delivered the best results with precisely this asset class. Due to the specificity of these instruments the most obvious trends are drawn out on longer time-frames, such as D1. Fig.7 clearly displays the direct correlation between the rising value of a cryptocurrency like bitcoin (BTC, upper graph) and the profitability of the Moving Average advisor’s trades of the BTC/USD pair on D1 (lower graph). Using the displayed settings, the advisor managed to demonstrate a profit of USD 4769 with a drawdown of USD 1473 and a maximum risk of 10% over 36 trades. This constitutes the best result we have seen in our analysis.